Another year has passed in the concrete floor grinding and polishing world. We can conclude that the flow of new machines and tools is constant as well as the number of players. Perhaps some manufacturers are holding products back for Bauma next spring. The global concrete floor grinding and polishing industry did not decline during the year. Since the consolidation of the industry, some years back, the number of suppliers of concrete floor grinding and polishing systems has stayed more or less constant. However the world of concrete floor grinding and polishing is still somewhat divided. In Europe concrete floor preparation or floor grinding for removal of glue and epoxy residue, as well as levelling or evening out concrete floors, is still dominates. Concrete floor polishing is increasing, but at a very slow pace. Sectors where polished concrete floors are considered an end-flooring product are mainly warehouses, industrial premises and supermarkets. Staining of new concrete floors has come to Europe, but is still quite rare. For the method to really break through the market probably need another five years. Painted floors and epoxy is by far the most dominant method for covering. But where we see a change is among the contracting groups carrying out concrete floor preparation and polishing. Sweden has carried out these services for more then 20 year and the contractors are either specialised flooring companies, concrete sawing and drilling contractors or demolition contractors. It has always been this way and it is mainly the concrete cutting contractors that have dominated the sector of floor preparation. But it is clear that almost every country in continental Europe it is the same group of contractors that carry out these services. However, it has not always been like this. There has been a strong increase in this area over the last five to ten years creating a new service sector and new job opportunities for many concrete cutting and demolition firms. In the US the situation is completely different in some ways and other ways not. Concrete floor staining and polishing does not have a long history in the US, but was embraced when it first was launched about 10 years ago. Currently there is a large number of specialized flooring companies working solely with concrete floor preparation, staining and polishing. There are several associations and institutes focusing on this and something that the European market has not seen. In the very beginning it was quite rare that a concrete cutter or a demolition contractor would take on concrete floor preparation or polishing, but that has changed. Currently there is a growing interest for these services, particularly branch associations, like the US Concrete Sawing & Drilling Association, which is emphasising these new services in their programme. CSDA organise training sessions and offers documentation and training studies. If there are two geographical areas in the world where concrete floor polishing is taking market share it is first on the US market and in Australia. In Australasia and particularly Australia the situation is similar to the US. Australia adapted quickly to the new trends to grind and polish concrete floors thanks to King Concepts’s products and methods, which was acquired by Husqvarna Construction Products many years ago. The same applies here where concrete cutting and demolition companies often carry out these services and the trend is increasing. In the rest of Asia the increase in modern concrete floor grinding, polishing and staining, changes from country to country. China is a huge market with a great potential, but still professional contractors in this area are very few and quite big working almost nationwide. Same as in Europe it is mainly manufacturing facilities, warehouses and shopping malls that choose polished concrete floors. In China there is a large number of manufacturers of diamond tools for grinding and resin pads for polishing. Korea is a maturing market for this sector as well with a number of manufacturers and a growing number of contractors carrying out the services. Another potential area for concrete floor grinding and polishing is Africa. The Arabic speaking northern region of Africa has been adopting these methods during the last few years and there is a lot to be done there. The same goes for South America that is a bit ahead of Africa. Currently there are a number of manufacturers of floor grinding and polishing equipment in various countries in South America. Markets with the strongest potential are Brazil, Chile, Colombia and Argentina, where Brazil is considered to be the market by far with the strongest potential with billions of square kilometres of concrete floors. With an overall growing market globally the pace for developing new and better machines and tools is progressing faster and faster. Fast and efficient tools, stable, sturdy and easy to manoeuvre machines, working environment and safety are the key parameters for the products. A sector that has been recently prioritized is how to handle dust extraction efficiently. 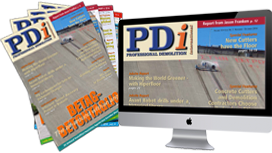 Particularly in Europe the handling of hazardous and normal concrete dust has become a big issue. There are a number of new solutions to handle dust more efficiently. This concerns new dust extractors and collectors and new tools and devices on grinders that prevent dust from spreading in the air. There are also close relationships between manufacturers of floor grinding and polishing machines and manufacturers of dust extraction equipment. Blastrac recently developed Diamag maintenance pads for polished concrete and asphalt floors. The pads are for use as the last step in the polishing process, for a super fine result. These pads are made of synthetic fibres mixed with horsehair and resin containing diamond particles. The Diamag maintenance pads come in different sizes and several grit sizes. Pads of up to 100 mm are for handheld machines such as our Supraflex. Pads of 155mm to 240mm are for use in combination with Blastrac triple head grinders, BMG-435SC, BMG-435P, BMG-535PRO, BMG-580PRO, BMG-735PRO, BMG-735RS, BMG-780PRO and BMG-780RS. Depending on the floor to be maintained, or how far the contractor is in the polishing process, a different grit size is needed. Blastrac recently introduced a new single disc grinder and a new triple disc grinder. Blastrac grinders have a reputation for quality of work produced on industrial and decorative flooring, but also in decontamination and demolition markets. They are available in many sizes for use in a wide variety of applications. The new Blastrac BGS-250 single disc grinder is equipped with a fold-up system and is easier to transport than the standard BGS-250 model. The machine is equipped with a tool holder to easily fix the diamond tool when it has to be replaced. Another feature with the BGS-250 is the easy adjustment of the height of the grinding head by changing the wheel position. This makes the BGS-250 very flexible to use with one of the many different diamond tools. The new Blastrac BMG-555 triple head grinder is equipped with a patented planetary grinding system. It has an ergonomic design with a handle locking system for changing its position. Also for the operator Blastrac has included some new features, like a bottle holder, extra protection of operating buttons and storage for a Smartphone. The BMG-555 has a floating shroud with extra floor nozzle on the back for even better dust extraction from the surface. Italian manufacturer Klindex has introduced a new remotely controlled planetary grinding machine with variable speed and adjustable working pressure called Expander 850 RX. It is for medium to large surfaces and is available in two versions of 15kW and 18kW. The main features with the remote control are the possibility to control all the working functions. Other features are the working width of 850mm with three 240mm tools. The speed of tools ranges from 300revs/min to 1,300revs/min. There is an automatic adjustment of the working pressure. There is an adjustable inclination of the planetary system to allow bigger frontal cutting. A third front wheel can be inserted for easy transport and loading into a van. The machine is battery powered for independent traction when unplugged and the levelling of the planetary system is automatic. Klindex is also releasing Elica diamond pads, which, according to the manufacturer, are the best solution for preparation of concrete, terrazzo and natural stone. The Elica pads can be used wet on natural stone or dry on concrete and screed. Thanks to the flexible support and its design it allows fast grinding, sanding and honing the surface to leave a homogeneous finish. Elica is an ideal solution for semi gloss, honed and matt finish on trowelled concrete or screed without exposing the aggregate and for concrete preparation before densification and sealing. 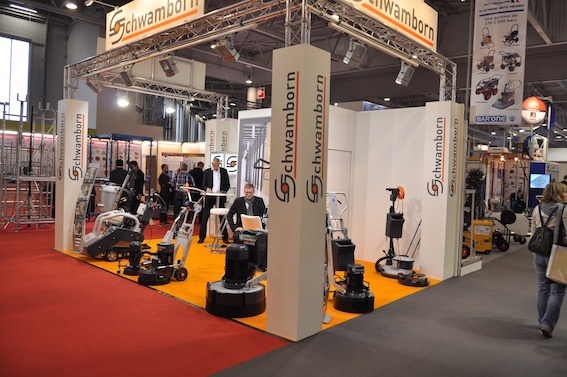 Schwamborn is one of Europe’s oldest family owned manufacturers of concrete floor grinding and polishing systems, including machines and tools. For more than 45 years the company has offered complete solutions for floor preparation and maintenance. All products and tools are developed and manufactured in Germany. Schwamborn has a wide product line. These include the DSM series of grinding machines, OMF cold milling machines, BEF concrete and screed milling machines, STR single disc multi-purpose machines, EU ultra-high-speed machines, ES single discs for floor cleaning and floor polishing, EP high speed machines for high gloss polishing and STS vacuum cleaners. At the French show Batimat in November Schwamborn exhibited through their French subsidiary and showed a portion of their products including the upgraded DSM 450 and DSM 400. Lavina floor grinding and polishing machines have been available for contractors for over 10 years. The latest Lavina X series was introduced at World of Concrete 2015, and proven to be the most efficient, versatile and easy to use Lavina line. Some of the new features of the X models include chain-driven forced planetary drive, updated head design, metered water flow for more efficient wet grinding, improved handle locking for better stability, new maintenance window on the machine base and easy maintenance. The Lavina model range covers projects of all sizes, including 762mm and up grinders for large commercial projects (L30, L32, L32M and L38GR X models), 635mm grinders in the mid-size class (L25-X and L25L-X), and 508mm and under for small projects (L21-X, L20-X and L20N-X). The most popular Lavina model for 2015 in the US market has been the Propane L30G-X, a 762mm grinder and polisher with a low-profile base, three 343mm heads and Kawasaki engine. It offers high productivity and takes little time to set up. For small projects and DIY use, the new economy L21-X model 534mm, 110V, variable speed has proven to be an ideal solution. Superabrasive is also increasing its share in the floor maintenance market with the unique LB36G-S burnisher, a 914mm propane hybrid machine that can be used also for honing, polishing and maintenance, and the ShinePro diamond system. In markets outside the US, Superabrasive has seen a huge interest in the self-propelled L32M-X, 813mm, 380/480V model. Superabrasive is working on new propane and self-propelled models which will be introduced in 2016. The company will be at WOC 2016 at booths S11627 and O31517. They will also exhibit at Bauma 2016 in hall A1.211 and outdoor 12A.4. Sase Company in the US manufactures and distributes concrete polishing, preparation equipment and tooling directly to customers. According to Sase the company offers the most complete line of concrete polishing equipment and tooling in the industry. The product range consists of planetary diamond grinders, dust extraction units, scarifiers, floor scrapers, hand held tools, and a wide variety of high quality diamond tooling. In the past 10 years Sase has been distributing their products globally and particularly to Europe. Through a co-operation with German distributor and manufacturer MKS Funke, Sase products are sold in Europe. MKS Funke and Sase have exhibited together at several Bauma shows and will also be at the next Bauma in the spring. Sase will also exhibit at WOC in February. At the Batimat show Sept introduced new surface preparation technology. The product line starts with handheld equipment of different diameters, and will be extended with multihead, long handle solutions. The principle is no motor, no electricity, no weight, no dust, no noise, and no vibration. It is a rotary system or an orbital random rotary system. The machines operate using the air of any type of vacuum cleaner connected with a power plug or battery. The grinders are very light and make long stainless jobs possible and can be used in humid conditions. The applications are for steel, composites, plastics, wood, gypsum and concrete in industries like decommissioning, automotive, construction, deconstruction, shipyards, carpeting, joiners, drywall, swimming pools and graffiti Alternative technologies for use of this system could be sanding, grinding and cleaning. US manufacturer General Equipment Company has release a gasoline-powered surface grinder SG24/GH. It was designed for use by contractors and homeowners, and features various grinding systems for breaking up deposits, cleaning/polishing concrete and tile, producing exposed aggregate slabs, and other general concrete grinding applications. Powered by a Honda engine, the SG24/GH includes dual counter-rotating multi-accessory discs that rotate at 250revs/min and offer a maximum grinding width of 610mm. The design balances forces to help reduce operator fatigue while enhancing machine control. An adjustable operator handle accommodates different user heights and preferences. A wide range of industry-standard interchangeable attachments are available, including grinding stones, scarifiers, wire brushes, the Scrape-R-Tach coatings removal system, Diam-A-Tach diamond grinding stones and Pro Polish concrete floor polishing system. Also, the counter-rotating discs can be removed to attach standard 250mm diameter, multi-segmented dry diamond discs for other applications, such as removing plastic overlays and epoxies. Caster wheel height adjusts to accommodate different multi-accessory requirements. The SG24/GH has a unitized, welded-steel plate frame, high capacity self-aligning ball bearings and V-belt/spur gear transmission. A 75mm diameter vacuum attachment port and safety/dust shield assembly kit also comes as standard. “The Scancombiflex 800DSP represents something new that the industry has never seen before,” said Scanmaskin president, Claes-Göran Bergstrand. It guides the operator through the job and to an optimum final result. The new system saves time, money and environment. In time for WOC Scanmaskin is launching the smart floor grinding and polishing machine, which the manufacturer considers to be, and innovation for the industry. The Scancombiflex 800DSP guides the machine operator through the whole process. Thanks to the new integrated computer the machine gives accurate guidance to the operator through the control panel. Through sensors the operator receives feedback and warning when the tool wear is too high or when the tool is worn out. The sensors continuously measure the wear or thickness of the tool. With the manual mode the operator can choose the speed and the tools. “For us Scancombiflex 800DSP is a real revolution to the industry and we are really excited to introduce it at the World of Concrete in Las Vegas,” said Bergstrand. Visitors will find Scanmaskin in booth S10515 and O31250 at WOC and will also be present at Bauma in Germany next spring. When grinding and polishing to high specifications of hard materials, such as concrete, terrazzo and stone materials, one major risk factor is glazing. Glazing or over heating of the diamond tools causes poor cutting rates and shorter tool life. The introduction of the AirFlow technology in February 2015 was an important step in HTC’s ongoing development process, and has been well received by professional floor grinders. The Airflow tool holders create an increased and controlled flow of air below the grinding cover, which results in significantly lower operating temperatures around the diamond tools and improved dust removal efficiency. New HTC grinding machines 650/800 HDX/RX and 950 RX are equipped with AirFlow tool holders as standard. It is also possible to retrofit AirFlow on existing HTC machines of the same models. Zig Zag grinding segments are a high performance, additional tool for use in surface preparation applications where high speed is required. The applications are for surface preparation and available grit sizes are 150mm, 406mm and 6,16 and 762mm. Bond qualities are medium, hard and very hard. Some of the features and benefits, according to Worx+ are the incomparable production rates, the outstanding removal and grinding capacity, the extended tool life and the fact that the tools are extensively field tested. Also from Worx+ are the new Zig Zag cupwheels. These, according to the supplier, are the perfect choice for rapid and aggressive medium to hard stock coating removal and grinding and levelling of concrete. It is excellent for the removal of thick roll down coatings, glues and similar coatings where an aggressive high-speed tool is required. stock removal. It is perfect for removal of thick coatings such as levelling compounds, mastics, epoxies and adhesives. It fits also general jobs of grinding and levelling of concrete. This is a high-speed tool with a 100% money back guarantee, according to Worx+. The cup wheels are available in 125mm, 150mm and 180mm diameters. The grit is 16 with a soft bond. For soft concrete solutions Worx+ has released the new super hard 30 grit diamond tools. According to Worx+ it has exceptional performance for very soft concrete or highly abrasive surfaces. “You won’t find another more long lasting and high wear resistant diamond tool with a 100% money-back satisfaction guarantee,” said Worx+ representative Jarka Kluth. In addition the Worx+ Specialty polishing range is available in grits 50, 100, 200 and has been designed for efficient scratch removal for the metal bond to resin bond transition process and dry polishing of densified concrete floors. The line offers exceptional low grit performance. Their rigid shape ensures a flat and consistent finish between aggregate and matrix. It is moisture and water tolerant and the pad is 10mm thick. Bush hammering is a method of giving the appearance of carved stone to concrete. It provides an authentic look to concrete, whether new or old. In addition it also has anti-slip properties for pavements or stairs. Bush hammering has many advantages, including no use of toxic products, very little amount of dust, no heavy lifting and bush hammer plates being fitted directly onto the planetary grinders. The surface result depends on the type of bush hammers, including the number of tungsten spikes. The company Au Tour Du Beton offers various models made in its workshops in Dinan-France. Hand held bush hammer systems, 120mm and 155mm for hand held grinders, are equipped with double bearings for better shock resistance. These systems are made of anodized aluminium plates together with silent blocks. The bush hammer plates made for planetary grinders, ranging from 185mm to 270mm, can fit any machine on the market. According to Au Tour du Beton, the company is the only one in Europe to manufacture and offer a lifetime guarantee to its bush hammer systems. To use bush hammers safely, Au Tour Beton has created the Scoot system. This is a unique tool that turns the ordinary grinder or polisher into a universal tool. It comes in three sizes and fits all grinders and is an accessory that will allow the operator to work more safely and with increased comfort.